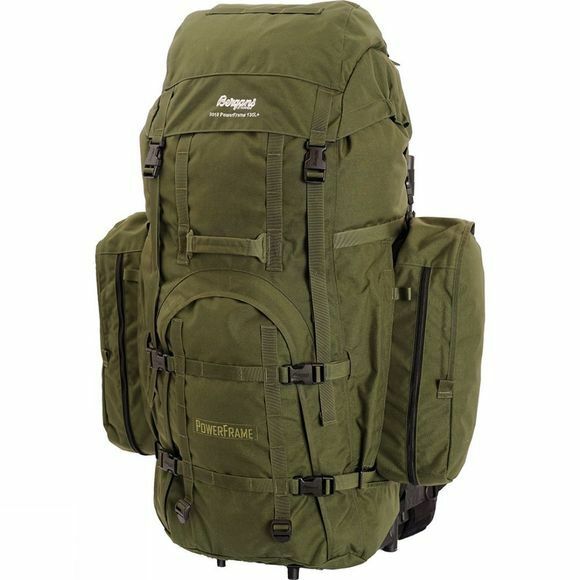 Leave civilisation behind and head into the wilderness with the PowerFrame Rucksack 130L from Bergans. It has a fully adjustable carrying system integrated in an external frame making a big burly rucksack comfortable to carry. The entire pack is detachable from the carrying system in order that the carrying system can be used to haul other large loads and in order to make carrying such large loads safe and comfortable there is individual height adjustment for each shoulder strap. The hipbelt is conical in shape and has sled attachment points for the more adventurous amongst us. The main pack is a top opening pack with spindrift collar. A zip at the front opens half the pack for better access to more of your kit. The inside can be split into two separate compartments if desired for better organisation and the expandable side pockets can be converted into a small daypack. The bag is also able to accommodate things like skis, hiking poles and fishing rods for your convenience. The top lid is detachable and has an internal and external pocket for storing essentials you might need quick access to and compression straps on the bag are excellent at stabilising the load you are carrying and reducing dead space in your pack.